The secondary market trading of digital asset securities. There hasn’t been a consensus around whether the SEC is doing too much, or not enough with regards to regulating cryptocurrencies or digital asset. For example, in late July 2017, the SEC released its Decentralized Autonomous Organization or DAO Report. This report claims that tokens that consist of an embodied computer code and executed on a distributed ledger technology through blockchain are securities. Therefore, DAOs are required to comply with U.S. securities law. Even so, several SEC officials, including William Hinman, Director of the Division of Corporate Finance, have stated that cryptocurrencies such as Bitcoin and Ether are not securities, and are thus exempted from federal securities regulation. 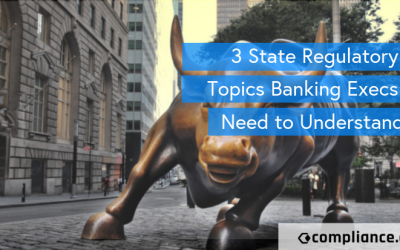 The nascence of digital asset securities and cryptocurrencies make them an exciting regulatory topic to follow. Here are our thoughts about the SEC’s enforcement actions relating to digital asset securities during 2018, and what they mean for the future. 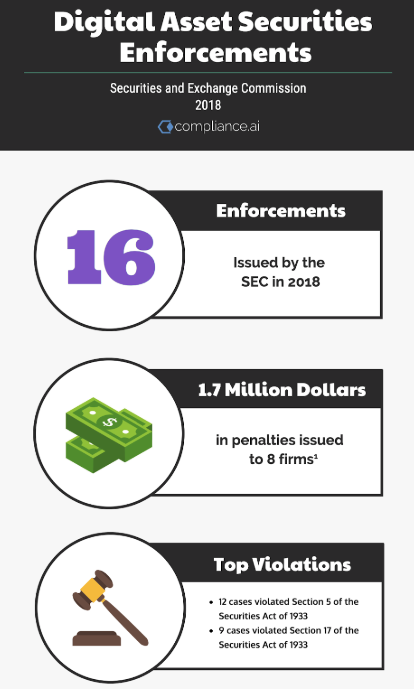 In 2018 there were 16 cases where the SEC issued enforcement actions related to digital asset securities. In these cases, the SEC either halted Initial Coin Offerings (ICOs) and secondary market trading or imposed other penalties on securities violations. All of these cases involved the unregistered, non-exempt sale of securities or fraud and misrepresentation during the offering. Out of 16 cases, 12 involved failure to comply with Section 5 of the Securities Act of 1933 (Registration of securities), Section 15 of the Securities Exchange Act of 1934 (Registration of Broker-Dealers), and Section 7(a) of the Investment Company Act (Registration of Investment Companies). In nine of these cases, the SEC pursued violations for fraud and misrepresentations related to the offer or sale of securities, citing violations to Section 17 of the Securities Act of 1933, Section 10(b) of the Securities Exchange Act of 1934 and Rule 10b-5(b) thereunder (insider trading). 9/11/2018 TokenLot LLC, Lenny Kugel, and Eli Lewitt Sections 5(a) and (c) of the Securities Act. Section 15(a) of the Exchange Act. 9/11/2018 Crypto Asset Management, LP and Timothy Enneking Sections 5(a) of the Securities Act. Section 17(a)(2) of the Securities Act. Section 7(a) of the Investment Company Act. 11/01/2018 SEC v. 1pool Ltd a.k.a. 1Broker and Patrick Brunner Sections 5(a) and (c) of the Securities Act. Section 17(a) of the Securities Act. Section 10(b) of the Exchange Act and Rule10(b)-5 thereunder. 11/16/2018 Paragon Coin, Inc. Sections 5(a) and (c) of the Securities Act. 11/16/2018 CarrierEQ, Inc., d/b/a AirFox Sections 5(a) and (c) of the Securities Act. 11/29/2018 Floyd Mayweather, Jr. Section 17(a) of the Securities Act. 11/29/2018 Khaled Khaled ("DJ Khaled") Section 17(b) of the Securities Act. 12/07/2018 CoinAlpha Advisors LLC Sections 5(a) and (c) of the Securities Act. This table that lists all of the SEC enforcement actions related to Digital Assets in 2018, shows that agency activity followed the guidelines set forth by the relevant agency announcements made –in the DAO report, and in the Hinman speech, which stated that the SEC was “focused on such issues as broker-dealer, exchange and fund registration, as well as matters of market manipulation”. The main debate surrounding cryptocurrencies is whether they should be regulated as other currencies or as securities, given the way they are used for peer-to-peer electronic money transmission, and exchange of goods and services. The crypto community has stated that there is a difference between utility and security tokens. They Howey test is used to determine whether or not a token is a security and needs to be registered with the SEC. But even if a respondent says they performed the Howey test, that doesn’t mean that the SEC agrees to their assessment. One example of this is the high-profile case of Munchee, a California business that created an iPhone app for people to review restaurant meals and then created and sold their own digital tokens, called “MUN”, to be issued on a blockchain ledger. Their enforcement document stated that Munchee’s MUN White Paper which referenced the DAO Report and stated that Munchee had done a “Howey analysis” and that “as currently designed, the sale of MUN utility tokens does not pose a significant risk of implicating federal securities laws.” But the SEC felt that the MUN White Paper, however, did not set forth any such analysis. Overall, the SEC applied the U.S. Federal Securities Laws consistently with its public statements and existing case law, which led to a relatively high number of enforcement actions in 2018, associated with the unregistered non-exempt sale of securities, and/or fraud and misrepresentations in the offer or sale of securities, cited in the table above. Based on the outcome of these cases, it is reasonable to believe that the SEC will only increase its crackdown on digital asset securities by evaluating them as a security, rather than currency. However, because digital assets have limited history in the market at this point, the implications of how either classification would impact the financial market or consumers, isn’t clear. So it is also likely that regulatory activity will continue to develop in 2019 and onward, as will new use cases, and then again, more information on how they are being enforced, which often indicates the risk factors or opportunities of using them. Not to mention, this is only at the federal level in the U.S., there is additional variance in how digital assets have been and will be regulated at the state-level and internationally as well. 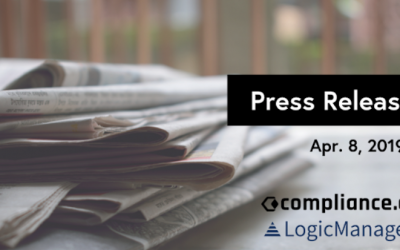 This post was written in collaboration with Christopher Schletter, a member of the Berkeley Boalt Global Corporate Law Society, and Compliance.ai’s Regulatory Intelligence Analyst, Sebastián Bravo. 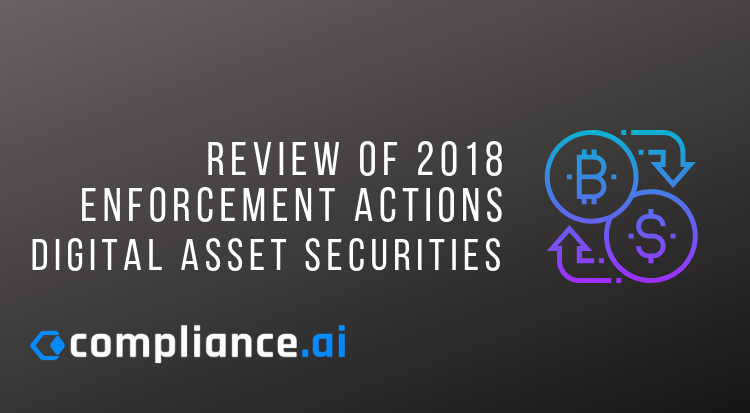 Compliance.ai’s Enforcement Action Tracker is an analysis of financial enforcement actions from Federal and State Agencies that we’ve extracted for you. 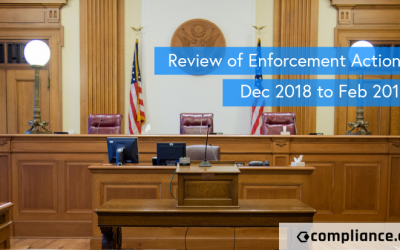 Subscribe now to a weekly email summary of enforcement actions, along with the respondents, penalty amounts, and violations.